Janie Pirie SBA specialises in floral and botanical art using coloured pencils. Her meticulously drawn and striking compositions have immensely accurate detail and great depth and intensity of colour. Sampford WI held a day long workshop at the Guildhall, surrounded by Helga Crouch pictures for inspiration. 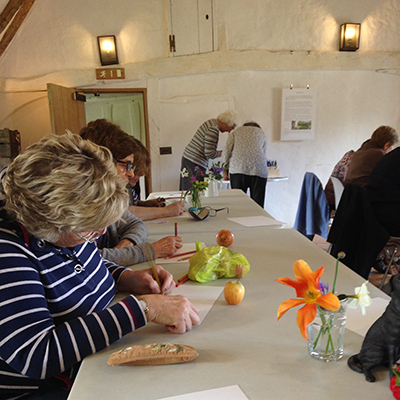 Jane gave her students an insight into drawing flowers and foliage with pencils and teaching techniques that she uses when creating her wonderful drawings. We hope to see her again soon, hopefully for an exhibition too!